Paul Deegan trained as a primary school teacher at St Patrick’s Training College, and subsequently took a BA in history and archaeology at University College Dublin. During this time he also studied singing in Dublin and Salzburg, and built a reputation on the recital platform in oratorio and light opera. In the early 1960s his twin interests of education and vocal studies led to his appointment as Vocal Supervisor at the Education Department of State University College, Cortland, New York, where he combined teaching with further study and took a Masters in Education in 1966. He continued his vocal studies in New York, and sang with Tri-Cities Opera in Binghamton NY. Back in Ireland he took his H.Dip.Ed. at Trinity College Dublin, and an LRSM in vocal teaching. While he continued to teach school (this time as head of a school for emotionally disturbed children) his reputation as a singer and voice teacher increased. Something had to give, so he left the schoolroom and concentrated on performance, teaching voice at the Royal Irish Academy of Music, where he later was Head of Vocal Studies, and for many years directed opera studies and the lieder class. He is now retired, but remains busy with choral conducting, private teaching and vocal workshops, and as an adjudicator and examiner. 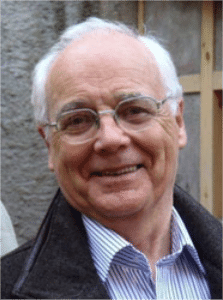 Heis a member of the council of Teachers Of Singing In Ireland (TOSINI) and has served on the Council of the European Voice Teachers Association (EVTA); in 2005 he was made an Honorary Member. For AOTOS, he has been Chair, and has served for many years as Irish (and now Overseas) Representative on the AOTOS Council; he is an Honorary Life Member.